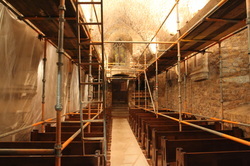 The project to install new lighting and new electrics has gone very well. The electricians finished at the end of February. During this week commencing Monday 4th March we have a team of cleaners in to clean the church and then we will put every thing back that has had to be removed for the last two months. We will be back in Church for Mothering Sunday 10th March with our usual service at 8am of Book of Common Prayer Communion; followed at 10.30am with a special Mothering Sunday Communion service which will be combined with a re-dedication of the church. It seems so appropriate to be able to have our first services back in Church on Mothering Sunday! The 6.30pm service of Celtic Evening Prayer will also be back in Church. Scaffolding in place on the North Side of the Church - whilst up it will also enable us to clean the roof brickwork and high cobwebs!